PDF files are quite simply the best means of sending a document to somebody else in a format you’ll know will appear exactly as you intend it to on their computer. It doesn’t matter what application has been used to create the original document, by exporting it as a PDF you ensure it won’t change appearance when viewed elsewhere. These days, you can create PDFs without having to shell out for the privilege – once of the best free tools for creating PDFs comes in the form of the excellent Nitro Reader. But PDF files need to do more than simply replicate the original design of a document – they’ve become increasingly interactive, with form-filling, annotations, digital signatures and much more. Some free PDF tools give you limited access to interactive features, but what if you want to go further? Perhaps you need to make minor alterations to the actual PDF document itself, or want to split or combine multiple documents into a single file? In the past, actually editing a PDF document meant an expensive purchase, but now Nitro Pro brings all the advanced functionality you need within the reach of individuals and small businesses too. Nitro Pro – as you’d expect – allows you to create fully editable PDFs from any application, whether through dedicated conversion options as found in Microsoft Office 2003 or later, or by using its virtual print driver, which allows you to “print” your PDF from within any application. Nitro even allows you to combine multiple documents from a myriad of different sources together via a single dialog: just drag and drop your files into place, tweak the running order and let Nitro do the rest. Nitro Pro also lets you edit the text and images in a PDF, swapping images, correcting typos or even editing entire paragraphs of text, plus adding headers/fooders and watermark. You can even convert existing PDFs back into editable documents, preserving the original layout – Word, Excel and a number of text formats are currently supported – plus extract images and text from the PDF easily. 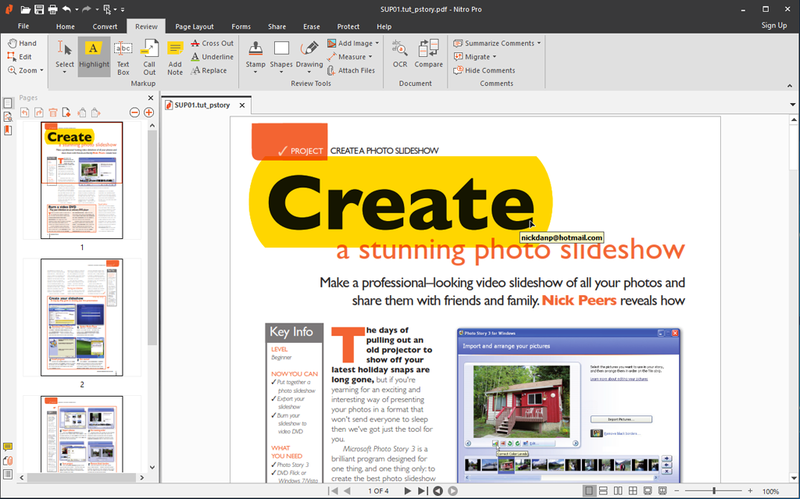 Throw in powerful collaboration and annotation tools – 100 per cent compatible with Adobe Acrobat, approval controls, digital signatures and form filling, plus the ability to secure and protect PDFs by restricting access and usage, and you’ve got just about everything you need from a powerful PDF editor. And the good news is that all that power isn’t hidden away – unlike rival products, Nitro utilises the familiar ribbon-like interface found in Microsoft Office, ensuring all its tools are both accessible and easy to use. Other highlights include an OCR engine as standard for extracting editable text from scanned documents. A new smart alignment engine makes it easier to enter text neatly into non-interactive forms, while auto-save and recovery reduces the painful consequences of possible data loss. Performance has been improved too, with both conversion times and output file sizes reduced.